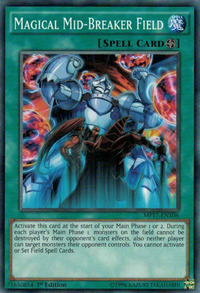 Mobius the Frost Monarch, Mid Shield Gardna, Breaker the Magical Warrior, and several copies of Maryokutai appear in this card's artwork. The artwork implies a relation between the events seen in Prideful Roar and Inverse Universe, in which Mobius appears fighting Breaker and Mid Shield Gardna, respectively. Mid-Breaker in this card's English name is an allusion to the appearance of Mid Shield Gardna and Breaker the Magical Warrior in the artwork.